For the first time since 1975 Carol and I visited a bicycle trade show with no particular job to do or goal to fulfil. We don't buy or sell bikes or parts any more, we sold Torelli three years ago. Since Torelli wasn 't displaying at Interbike this year, we didn't even have the job of helping out in a booth. We just wandered around the giant show hall seeing old friends and looking at all the pretty bike parts. What follows is the result of our brownian motion through the show and a report of what caught our eyes. My overall impression of the show was that no one had reinvented the wheel. Here's the short form: Campagnolo didn't have its electronic shifting ready and bikes still have two wheels and rubber tires. Some of the tires have tubes, some don't. Headsets got more complicated. Most product lines got small incremental changes. Probably the biggest news from Vicenza was their decision to produce cyclo-cross specific parts and wheels. This mostly involved taking existing production and improving their bearing seals. 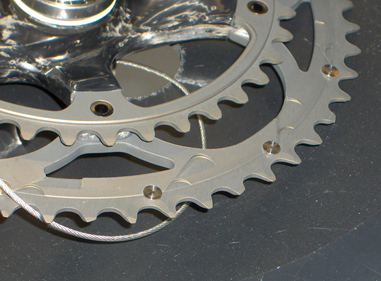 In the case of the cranksets, this also meant new chainring combinations. With the exception of brakes, a cross rider can now ride an all-Campy bike. And if he really needs Campy cantilevers, I'll bet there are old 1989 Campy Centaur off-road cantilever calipers on eBay. I don't know if old Centaur calipers would meet the needs of a modern competitive cyclist, but one must always fa un bella figura (cut a good figure). I liked the approach Campagnolo took to the 11-speed Super Record group. Each part was examined for possible performance improvements. This resulted in lots of little tweaks all over the group. Nearly all of these changes have been or will be incorporated in the rest of the line. Campy 2011 front derailleur (above) and crank (below). Note the added lift pins and ramps. For the front derailleur the outer pivot forging (that the cable attaches to) was beefed up a little. And more importantly, the angle of the cable attachment slot was improved to optimize the cable force on the derailleur for up shifts. On the crankset the chainrings got a big redesign. There are now 8 pickup pins and there are now better ramps to help get the chain up to the big rings. I don't have to tell you that dropping the chain to the little ring under load can be fraught with trouble. The tooth profiles have been changed to give a better release of the chain from the big ring. The left Ergo lever (to the front derailleur) now has an elliptical cable pulley so that when the rider first pulls on the shift lever a lot of cable gets wrapped up to get the action going fast. Then, as the pulley diameter decreases the lever exerts a stronger force during the final leg of the shift. This gives the rider a faster shift. 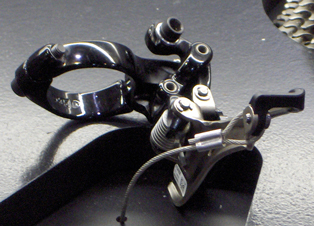 The right (rear) lever has deeper, stronger, more positive clicks so that the rider has better feedback from the lever. The bearing and ratchet system inside the lever is all new, promising longer wear. The goal was to reproduce the special feel the pros prefer that was part of the "Red" group. The rear derailleur now has full carbon pivot parts, making the rear derailleur lighter and stiffer. I like the feel of single pivot rear and dual pivot front, it seems just right to me. But I'm a little guy. Bigger riders wanted a more powerful rear caliper so Campy has answered the request for a Super Record dual-pivot rear caliper with its higher mechanical advantage. 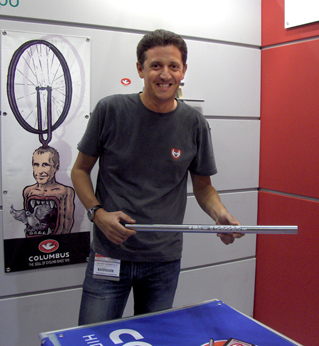 Our good buddy (and former legendary framebuilder) Mauro Mondonico is now the international sales manager for Columbus tubing. He was dutifully manning their booth within the Italian pavilion when we came by. Each year the Italian Trade Commission rents out a large piece of real estate within the show to highlight Italian products. Columbus' new offering should set aflutter the hearts of many lovers of traditional lugged steel bikes who still want something cutting edge. Columbus now has a version of its XCR stainless steel tubing for lugs. Advances in metallurgy mean that there is no need for any compromise when building with stainless steel. The tubes are modern oversize (31.7mm downtube) and drawn to 0.45mm wall thickness. The TIG-specific XCR tubeset has tubes drawn down to 0.4mm. OMG!This is very, very sweet. XCR tubes require stainless steel lugs, dropouts, and braze-on bits but they are available now. And they must be brazed with silver solder. This is very, very cool. Bill want. Bill want bad. Dario Pegoretti has asked Columbus for XCR tubes with 35mm downtubes for more versatility in meeting his customers needs and Columbus is going to produce XCR tubes for lugs in super-oversize next year. A lugged frame built with XCR tubes won't be cheap. Producing these tubes is difficult and expensive. Just the tubes will cost your builder hundreds of Euros. If you do show up on your club ride with a lugged stainless steel frame, I promise you that you will fa una bella figura. Mauro told me that around the world the demand for steel tubes keeps rising. So much so that they have brought back Max, Minimax and Cromor tubesets using modern metallurgy. These are not the same tubes Columbus made in the 1990s. Now the range of Columbus steel tubes is as large as it has been in years. Threaded steering tubes are even being produced. A growing steel tubing business means that there are still people who care about how a bike rides. Maybe the dark ages are over. There is always hope. From 1998 to 2006 I was Vittoria shoes' importer. In that short span of time what used to be a simple, straightforward piece of equipment evolved enormously. In 1998, arguably the hottest cycling shoe in the world was the Vittoria Blitz which was worn by Marco Pantani to his Giro/Tour double victory. It was a simple enough design; three velcro straps, nylon with carbon fiber fill sole and Lorica uppers. The beauty was in its perfect design and workmanship. I think it was the lightest shoe on the market. It was perfect for its time. I think the retail price was $179.00/pair. Very quickly carbon fiber outsoles became the standard for high performance shoes. A top ratcheted buckle closure with two velcro straps became the standard and shoes became complex and a bit more spendy. Today wind-up wire lace systems are popular. The new Vittoria "Hora" has it along with a ratcheted buckle at the top. 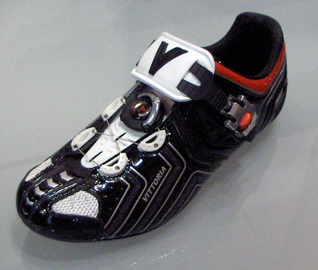 Wind-up laces are nothing new to Vittoria. In the early 1990s they produced a very popular shoe called the "Fulcrum" with a knob that could be twisted to tighten the shoe. Mario Cipollini won scads of races in them. There's nothing new. Vittoria's new Hora is almost infinitely adjustable. The buckle can be raised or lowered on the side of the shoe. The top pad can slide along the strap to be put in whatever position is most comfortable. 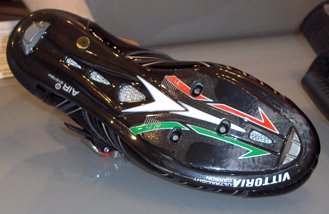 The Vittoria Hora shoe (above left), and its carbon sole (above right). 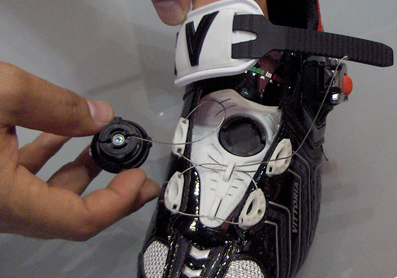 The wire lacing can be easily replaced (left). Like the old Fulcrum, the wire can be replaced in a minute by the retail customer. The wire laces can be tightened and loosened by degrees. Following Vittoria's desire to keep things as Italian as possible the carbon sole is still produced in Italy. Fatto a mano in Italia. Made by hand in Italy. A single shoe is 307 grams. Vittoria has an interesting plan to get its shoes into the hands (on the feet, actually) of American customers. Because they use skilled Italian artisans and the Euro trades at $1.30+, Vittoria shoes are not cheap. These are beautiful hand-crafted items made by people who care about what they do. There really isn't the room for a distributor to take his cut on the way by so Vittoria is shipping shoes directly to bike shops. I think this makes good sense. I don't have current pricing, but it should keep their Italian hand-crafted shoes price competitive with Asian product. Here's Vittoria's web site. If you want to get in touch with them, click on the "contatti" button at the top of the page. Some years ago I followed a pair of shoes as they were produced. If you want to see how shoes are made, click here. Celestino Vercelli, owner of Vittoria shoes, was a gregario di lusso. Here's our interview of a man who rode both the Giro seven times and the Tour twice. I always liked Viner bikes. When Carol and I were just starting Torelli, Viner was distributed by one of the oldest firms in cycling, Gus Betat & Son in New Orleans. By the time Betat closed its doors and the brand was available in the USA, I was too deeply involved with Mondonico and Torelli frames to consider another brand. But I liked them so much that I never left a European trade show without a new catalog and price list. So, when I went around a corner in the show and saw Viner frames I had to stop. Indeed, SRI Importing in Canada is bringing in Viners which are made in Tuscany; Pistoia near Florence, to be exact. Moreover, Rob Pryor, the owner of SRI, says that Viner has invested in the machinery to produce carbon frames on site in Pistoia. That is terrific news. It seems like a dark cloud has passed and Italy is back to making more and more of what it designs. 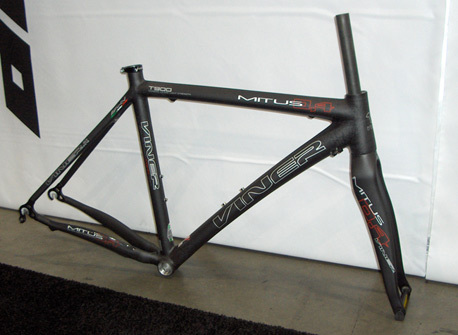 Viner Perfecta bike (above) and Mitus frameset (below). 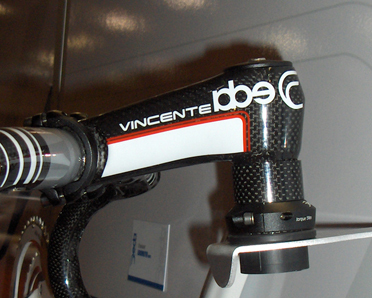 Since Viner makes its own stuff, they can do custom-geometry carbon frames. I was sober enough while I was at the SRI booth, but I still didn't get any pricing. I get distracted too easily by toys and forget to do real work. Viner makes a raft of carbon, aluminum and steel frames, for road, time trialing and cyclo-cross. There are a lot of bikes in their catalog. A lot. I think they need to pay me to go to Italy and test their bikes for them. Pistoia's a nice town and the Abetone pass is just up the road. That's where Fausto Coppi made it clear to the world in the 1940 Giro that he was an extraordinary rider who could do things that were beyond all other men. When we started Torelli, ITM was one of the first product lines we imported. We had no money yet they treated us if we had million-dollar purchase orders to give them. I still remember their stunning offices designed and furnished in the best Italian style. Going there really made me want to do well and have a place just like that. I think ITM hit its peak in the late 1990s when Marco	Pantani	used	the	"Big	One"	stem. 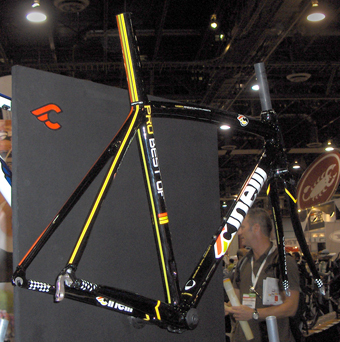 After that they came out with a super-light stem called the "Millennium". From	then on their products seemed to lose a bit of their punch in the market. I think they finally closed their doors about two years ago. It really made me sad. 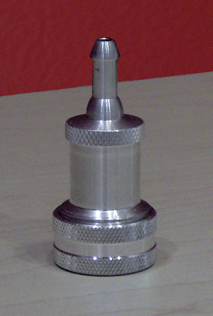 ITM Aries stem, viewed from the bottom. Now Luigi Seghezzi has revived the line. For some reason I keep running into Signor Seghezzi. He managed Bike Machinery when it was owned by Antonio Columbo (owner of Cinelli and Columbus tubing) and designed several pieces of custom-made frame preparation tooling for me. He's a knowledgeable and experienced hand in the bicycle trade and I think ITM will be in good hands. I asked Seghezzi what was new and he showed me their Aries carbon bar and stem. The stem is nice because of its hidden bar clamp system. The fork clamp bolts are almost hidden. ITM says that the stem is very stiff. Here's the web site of ITM's American distributor, Cycles Brixton. While we're talking bars and stems, let move on to Deda. Deda is doing it again. Somewhere back in the '90s Deda introduced the 32mm bulge diameter handlebar. Up until then 26.0mm was the standard for pro equipment (Cinelli was 26.4 until the mid 1990s when they capitulated and went to 26.0 as well). 32mm was quite a departure but it eventually became the industry standard. I remain crabby about it because I think 32mm bars are too stiff. But as usual, the world thinks I'm wrong. Now Deda has introduced 35mm bars and stems. These are really big. 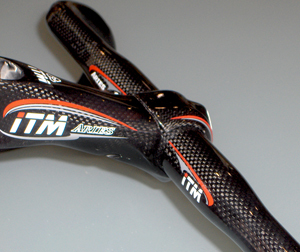 The M35 bars are monocoque carbon fiber. The 42cm (end-to-end) bars weigh 210 grams. The bars use what Deda calls their RHM (rapid hand movement) which features a really shallow drop (128mm) and short reach (75mm). 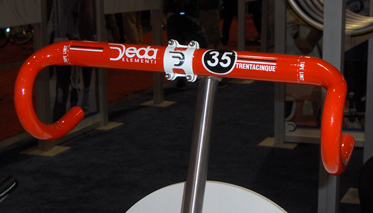 Deda has a matching forged aluminum stem called the Trentacinque (Italian for "35"). both the stem and the bars can be had in red, white or black. Deda isn't going to produce other 35mm bars and stems until it has a chance to assess the markets reaction to the new dimension. Like many riders I spent years cultivating a pedal stroke that just missed the top tube on the way by. Then along came threadless stems with their exposed steering tube fixing bolts which I scrape several times each ride. This never happened with Cinelli 1A or 3T Record stems. Deda has a solution that doesn't involve buying an old quill-stem equipped bike on E-Bay. Their new Vincente stem grabs the fork's steering tube internally, giving a smooth profile and leaving my thighs unscarred. Looking at the design, I think it also reduces stress concentrations on the steering tube that pinch bolts cause. I suspect this is a safer and stronger system. One man who has been a fixture at cycling trade shows for almost forever is Claudio Sacchi, owner of Silca pumps. After using almost every other pump in the world I have concluded that simple, devoid of frills Silca pumps are about the best. Sacchi's made a few changes. The barrel isn't steel anymore, it's aluminum, as is its base. For a while Silca pump bases were plastic and that was not what a Silca pump should have. The pump now comes with smart head (will work on presta or schrader) with a thumb lock. But I think it's best to toss that stuff and just use a regular Silca presta head. They used to be brass, but brass has lead in it so now the old Silca brass head is aluminum. If you have an old Silca brass head, don't eat it. The classic Silca pump, now in aluminum (left), and the new aluminum Silca presta pump head (above). 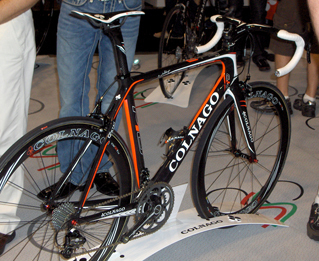 I have never visited a trade show and failed to find the Colnago booth packed from the show's first moment until the announcer says that the show is finished for the year. It is a solid testimony to Colnago's grip on the psyche of the cycling world. I still remember my first Colnago, a Saronni red (candy apple red, actually) beauty that I built up sometime in the late 1970s. It had less trail than I was used to because I had been riding English frames with very straight forks. I was prepared to thoroughly dislike it. Instead, I was entranced. It rode and handled like a dream. For reasons I can't quite fathom, I never got another one. I should have. 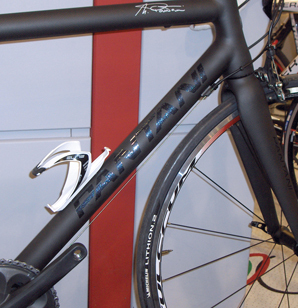 Colnago's new C59 lugged carbon frame captured the most attention. 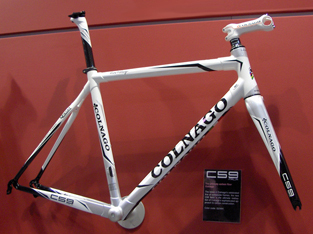 It follows Colnago's feeling that, given the current state of the art, carbon framesets should weigh about a kilogram. This maximizes reliability and ride quality. So far I haven't come across any bike that causes me to think this is wrong. 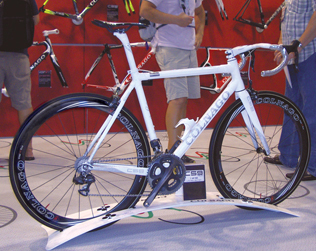 Above left: Colnago C59 frameset, with detail of chainstays below; above right: Colnago C59 limited edition bike; below right: Colnago M10 monocoque. 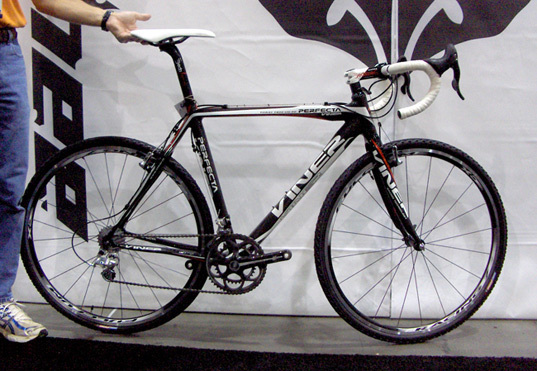 The C59 has big flat chainstays and star-shaped top and downtubes. 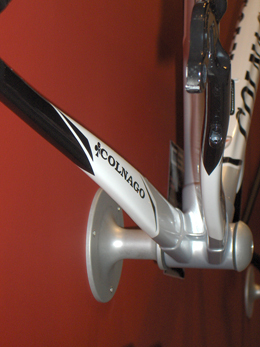 Colnago says that the frameset was designed to work well with both electronic and mechanical shifting systems. If the reader wants to empty his trust account (assuming he still has one if he's a bikie), there will be 59 limited edition C59 bikes. They's have the electronic shifting battery hidden in the head tube. I don't know how much they will cost. If you have to ask you can't afford it. Colnago also introduced a new monocoque carbon frameset, the M10, said to be both lighter and stiffer than the CX1 carbon monocoque. This is one of the grand old names in Italian cycling. Founded in 1906 the firm didn't survive the boom in mopeds and scooters that put a lot of European bicycle companies under stress in the early 1950s. That's when bicycle racing teams had to turn to "extra-sportif" or non-cycling companies, to sponsor their teams because they couldn't fund their teams in the face of declining revenue. But... I digress. The Gastaldello family revived the marque in 1969 and they've been on a tear ever since. 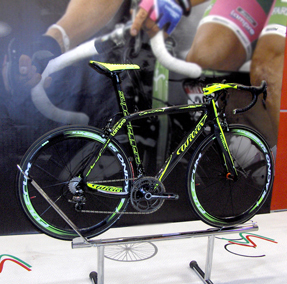 Currently Wilier-Triestina equips the Lampre team and has a contract with them through 2013. Lampre has Damiano Cunego for single-day races, Alessandro Petacchi for the big sprints and just signed Michele Scarponi for stage races. When the pros show up at bike shows, there's always a lot of excitement. 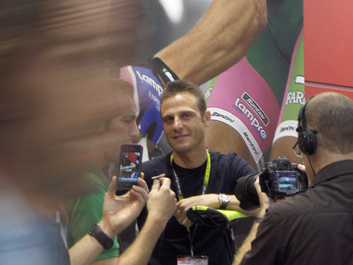 Alessandro Petacchi was no exception. 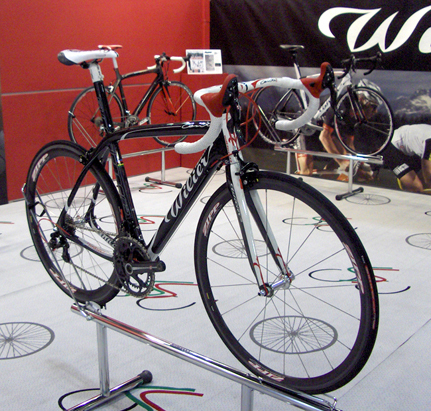 The Wilier Cento Uno in its regular Lampre team colors. The Lampre pro team rides the Cento Uno Superleggero frameset. It weighs 920 grams with seat post and bottom bracket. 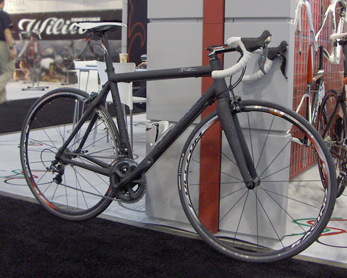 For better or worse the Cento Uno uses a Wilier proprietary bottom bracket. Between 1992 and 1996 Marco Pantani rode for Davide Boifava's Carrera team. The family that owned Carrera Jeans and was the squad's primary sponsor gave team owner Boifava the right to produce Carrera bikes for 100 years. Boifava's firm, Podium, continues to this day to produce a few thousand Carrera framesets each year. Now the late Marco Pantani's parents have given Boifava permission to produce Marco Pantani bikes with a portion of the proceeds to be given to the Marco Pantani foundation. The Pantani bike, detail at right. It will be interesting to see how the bikes do. Generally bikes named after racers who don't build their own bikes rarely do well. Seen a Louison Bobet, Jacques Anquetil, Gianni Motta or Steve Bauer bike in a shop lately? Maybe this one will be different. 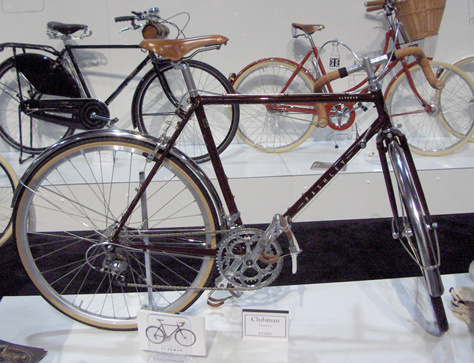 Bikes named after Ottavio Bottecchia had a heckova long run. I think Carnielli started making them in 1926 (LeMond was riding a Carnielli-produced Bottecchia when he won the Tour in 1989) and another Italian firm continues to produce Bottecchia bikes to this day. Antonio Columbo has turned the Cinelli brand into something that is a bit too hip, happening and urban for this aging baby boomer's taste. But, he has terrific engineers and designers, so the bikes and accessories end up being well thought-out and well made. Even I really liked the looks of the Cinelli Pro Race frameset made with Columbus XLR8R MAX carbon tubeset. OK, I'm a retro-grouch. I wear the name with pride. I want a bicycle to be beautiful and have a ride quality to match. When I hear salesmen try to tell me that this or that new carbon bike has a good road feel or really rides much better than other carbon frames, I feel like he's told me that he's got a dog poo sandwich that tastes better than the other dog poo sandwiches. So when I went by the Pashley stand I had to stop and look at their "Clubman" bike. It's a marvelously executed lugged steel bike with fenders, center-pull brakes and leather saddle. That final item I think should be reserved for the sixth level of hell. I grew up on Ideal and Brooks saddles and was thrilled when Cinelli, Selle Italia and Selle San Marco came up with something that wouldn't torture me. This is the kind of bike that can make a person fall in love with cycling all over again. It's not a racing bike, it's a riding bike.